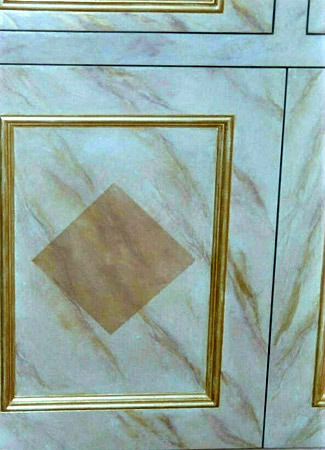 In a recent article published in the Bay Area Women’s Journal called “Faux Finishing…Get the Look of Marble and Stone“, I discuss the “faux” finishes of stone and marble (a kind of rock). 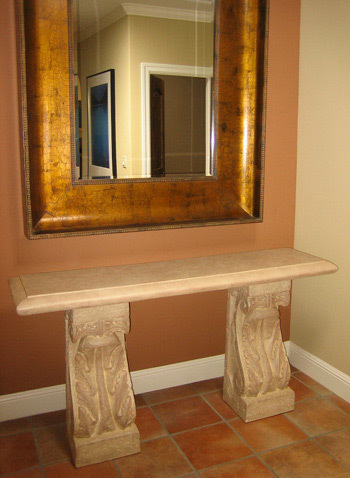 I created this “sister” post to show more painted and glazed stone and marble faux (fake!) 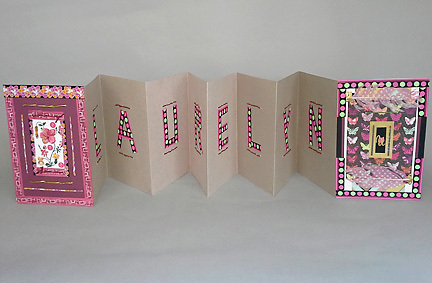 finishes, and to share a bit more about the process. 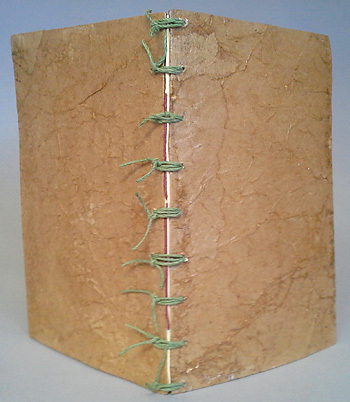 Stone blocking is a technique in which individual “blocks” of stone are depicted, as well as the grout between them. 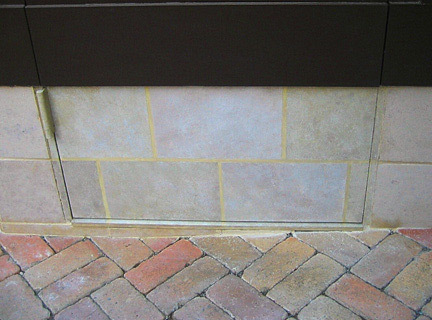 Below, the lower part of an exterior shed door is painted (stippled and pounced) to look like the actual stone blocks on either side of it. 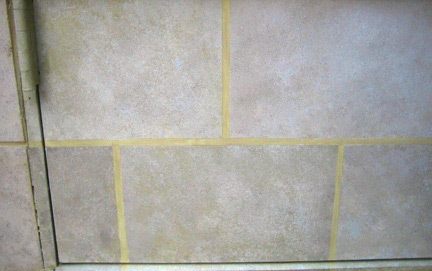 The grout, of course, is also painted. The painted door meets the real flagstones underneath it. Underfoot, as it were. the door is opened, which adds to the fun. The treatment satisfied the aesthetic yearning of the homeowner to have the eye perceive a line of stone blocks unmarred by the more prosaic brown-painted door. 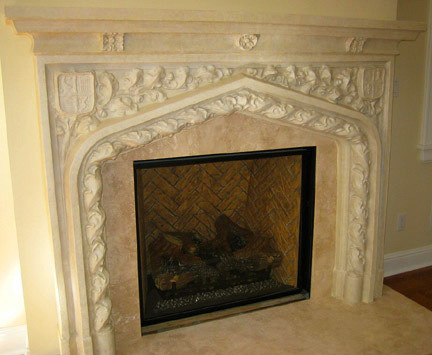 Below we have an ornately detailed fireplace, with a lot of carved character. It sits resplendent in its prepped glory, primed but not even base painted yet. 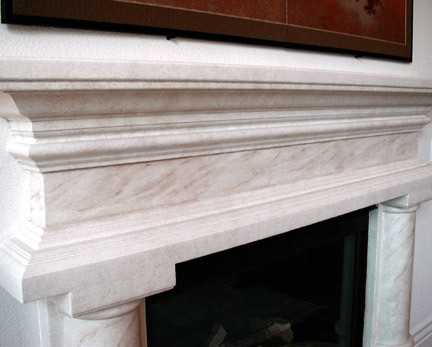 Looking white white, it is set off by a new marble surround and hearth. 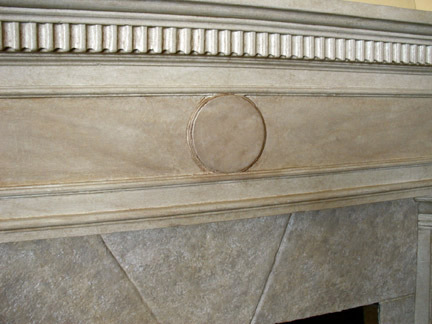 Voila, here we have the same fireplace with a stippled “limestone look” finish, which draws out its ornate detail, and works with the colors of the marble. The carving plays with the light, both reflecting and absorbing it. It is highlighted by the glazes (semi-transparent veils of color) that are stippled across its surface. 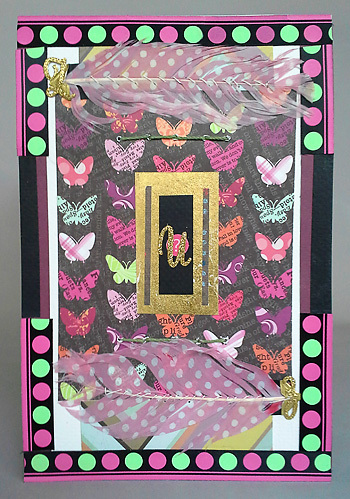 Details like this can be coaxed out and showcased through the addition of color and texture! or, a smooth, plastered, rather standard issue stove hood, which needs to be brought into line with the other splendid details of its Spanish Revival architectural setting. 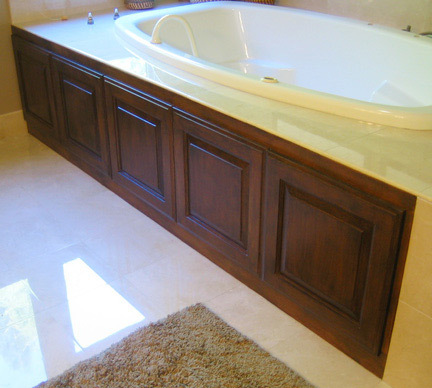 Stone finishes can also be used in tandem with their sometimes showier cousin, marble finishes, also known as marbling, or marbleizing. On the fireplace below, semi-transparent glazes were used to create the marble finish, and opaque paints in equivalent colors for the stone. 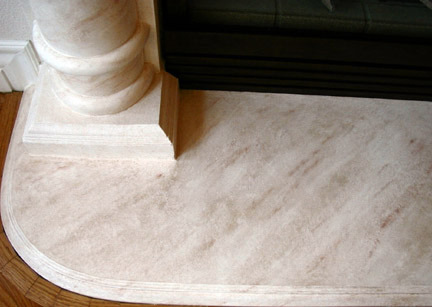 The marble and stone treatments are both set off by the classical detailing, which is in turn set off by the treatments! At their best, architecture, decorative treatments and detailing work hand in hand, each strengthening the other. 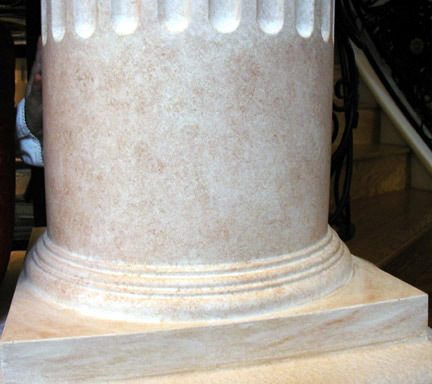 The pillar below is treated in a subtle limestone finish, with the same glaze colors employed in a marble finish on its base. In the same room and colors, the hearth below is marbled through the combination and simultaneous manipulation of several glaze colors over its smooth, base painted surface. 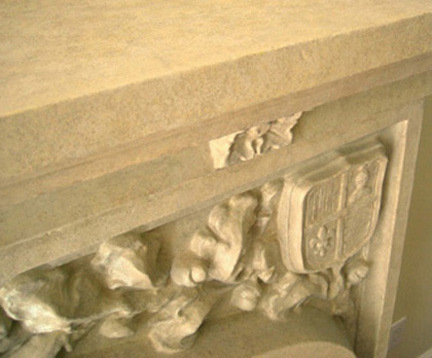 The same technique is employed on the fireplace mantel and pillars, unifying the piece. The Clients wanted to enhance the architectural details of their white-walled living room in an elegant yet subtle way, and the paint and glaze colorways were designed accordingly. 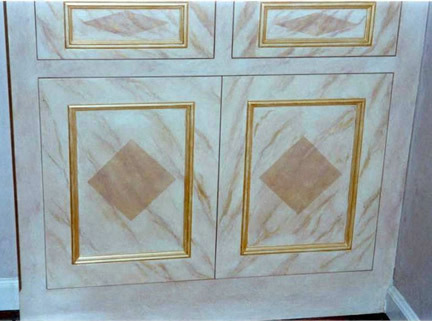 The fanciful marble treatment designed for the white, latex-painted built-in below is enhanced by the addition of gold, not only in the veining, but also on the inset frames on the cabinet doors. The diamonds are created by a second application of marbleizing. The fantasy marble finish employing pink, gold, and antique white glazes adds sumptuousness. The marbleized diamond offsets the rectangular shapes that comprise the cabinets. Whether the goal is to integrate, enhance, create elegance, luxury or history, the application of stone and marble faux finishes can add depth, character, mystery, and even fun and fantasy to a space. 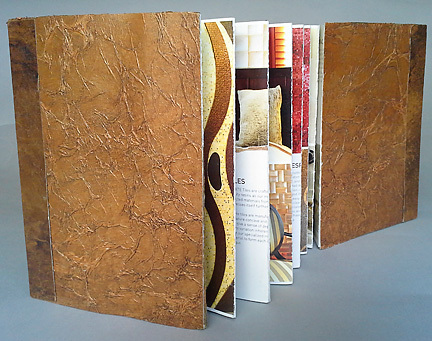 Take a look around your environment, and imagine the addition of finishes true to nature, to the imagination, or both! Consider drawing out classical or whimsical details, harmonizing your color scheme, or adding a bit of eye trickery to where you live, work and play. 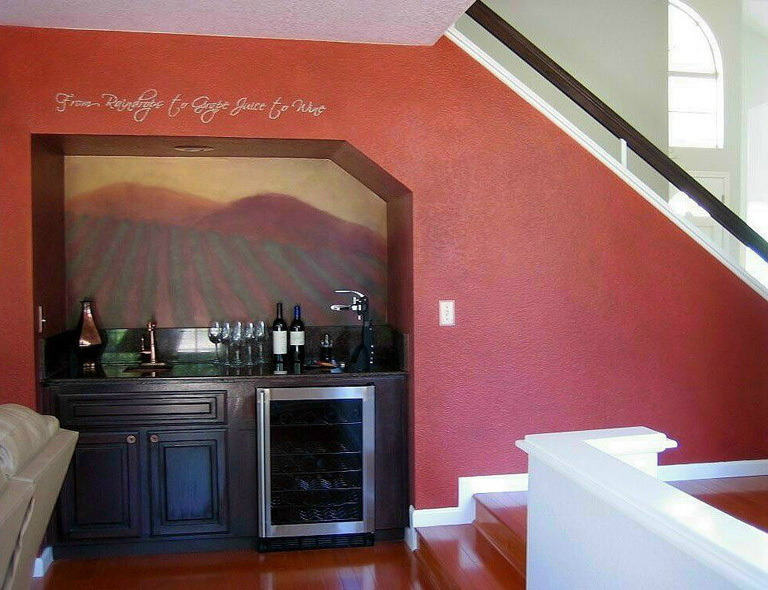 You’ll soon feel the benefit of the Magic of Decorative Painting. 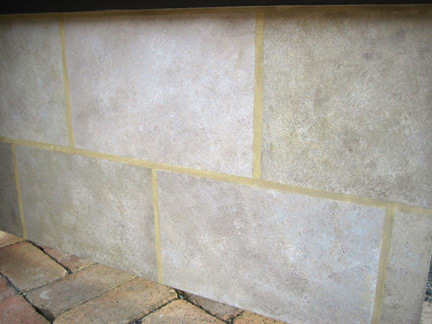 Have YOU used Stone and Marble finishes in your Home, Business, or Community Spaces? Remember, we are all designing this thing called Life, together. Cheers! The word “verdigris” comes from the Middle English vertegrez, from the Old French verte grez, an alteration of vert-de-Grèce, or “green of Greece”. The modern French spelling is vert-de-gris. What a romantic and poetic linguistic lineage. 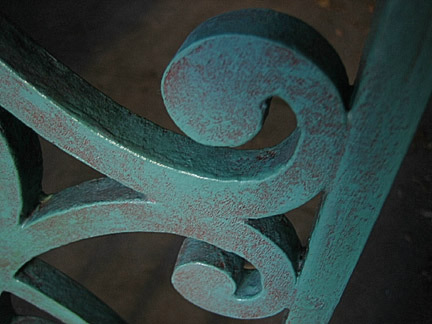 Verdigris is the natural patina which forms on the surface of copper, bronze, or brass as it is exposed to air and water, wind and weather over time. 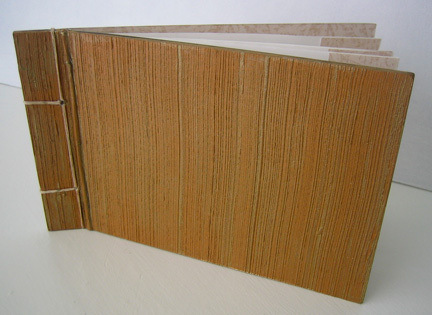 In essence, it is the weathering, or tarnishing of these metals, and shows itself in a variety of green hues. 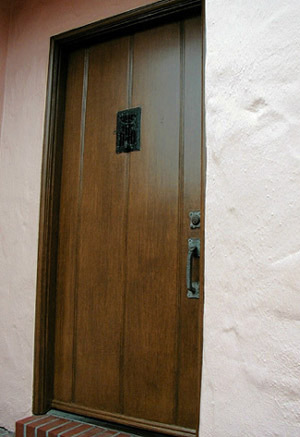 As a faux finisher, and decorative painter, the “look” can be achieved through the controlled (or not) application of chemicals to these metals, which form a blueish green “deposit’, or pigment. Indeed, verdigris was used as a pigment to create greens in paintings and other art objects. 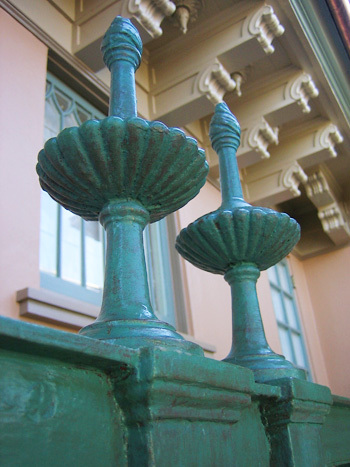 Until the 19th century, verdigris was the most vibrant green pigment (paint colorant) available. 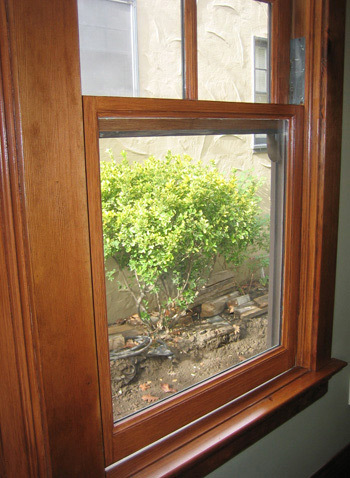 It’s earliest known use was in the 14th Century. 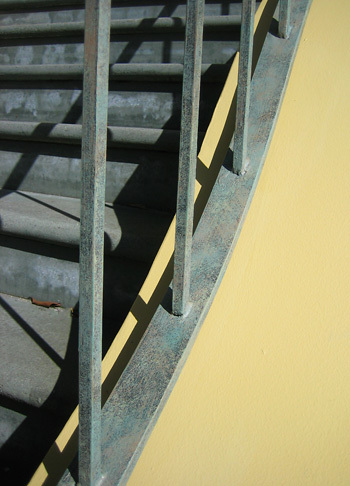 The other way of creating a verdigris finish. i.e., the look of verdigris, is by the simple or not so simple, application of green and other-hued paints manipulated over a base coat. 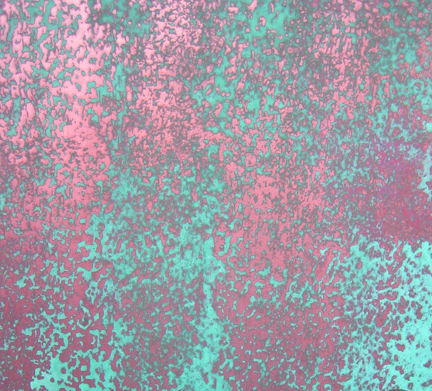 This method, to my way of thinking, is by far the more fun, as a virtual universe of verdigris can be created. 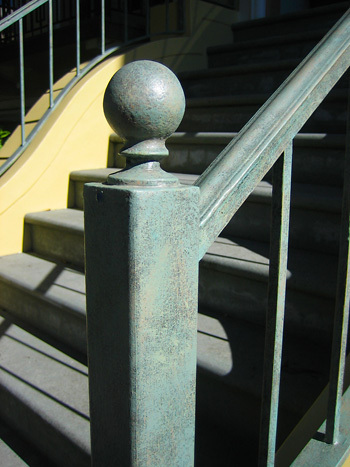 The effect of painted verdigris is by and large controllable, a claim which cannot always be made for chemical reactions. The vibrant, yet natural-looking verdigris finish above and below was created by manipulating one custom-mixed hue of green over an exterior latex base coat: Benjamin Moore’s “Pueblo Brown 2102-30”. The “verdigris” color is one part Benjamin Moore “Pear Green 2028-40” and three parts “Blue Spa 2052-40 “, drybrushed over a completely dry surface. 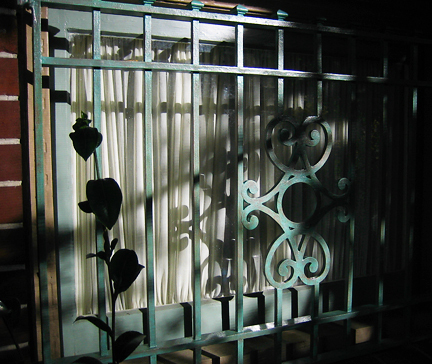 The verdigris color is wiped off is some areas, leaving a strie effect, and accentuating the texture of the base coated metal. The surface textures, shifts of plane, and interplay between base and top colors offer enough variety to make the treatment visually interesting, and believable enough for passers-by to comment on the “copper“! 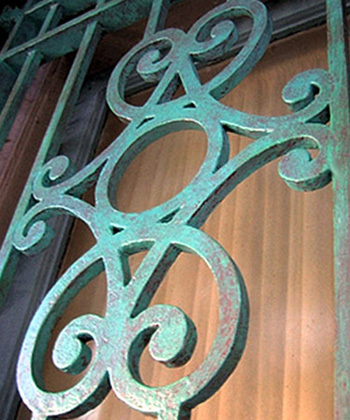 A verdigris treatment is often associated with copper, but as discussed above, also works with both bronze and brass. On the door above and below, the client wanted a loose (“messy” as she termed it!) look, that nonetheless complimented the charming building, and worked with the teal shutters and trim detail. 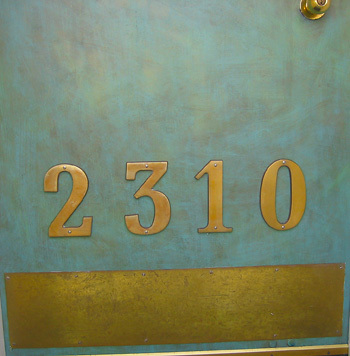 As the kick plate, address numbers, door knob, and mailboxes are a bronze hue, (as well as details of the light fixture), Benjamin Moore “Aged Bronze 231” was used as a base coat, with three blue to green hues dry-brushed over it to create the effect. 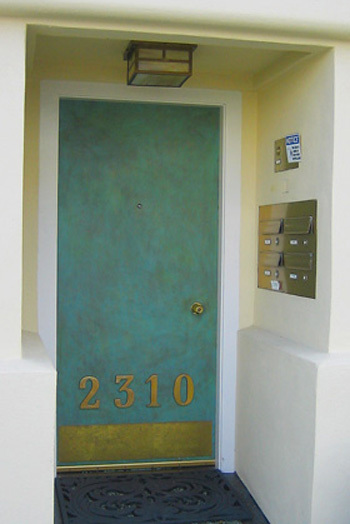 The bright golden-bronze hue provides a nice contrast to the cooler yet still warm greenish-blue flat exterior latex paints layered and manipulated over the darker base. The textures as well as the colors had to work in tandem to create a complete, coherent picture, “messiness’ not withstanding! 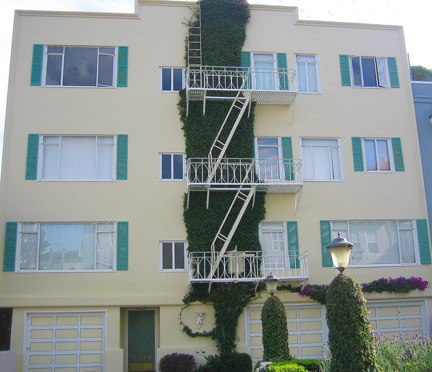 The rails above were base painted in a deep blackish green, Benjamin Moore “Black Forest Green (Exterior ready-made)” latex, then four more colors were applied consecutively over the base painted surface. First, the coppery-toned Benjamin Moore “Suntan Bronze 1217” was dry-brushed sparingly, then “Cypress Green 509”, followed by “Garden Oasis 699” were stippled,. (All Benjamin Moore exterior latex colors.) Finally, a touch of the custom “Blue Spa 2018-40” and “Pear Green 2052-40” mix mentioned above was added as a subtle accent. 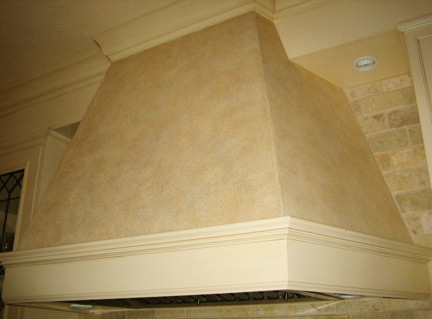 The application and layering of five colors in total adds depth and detail to the final finish. 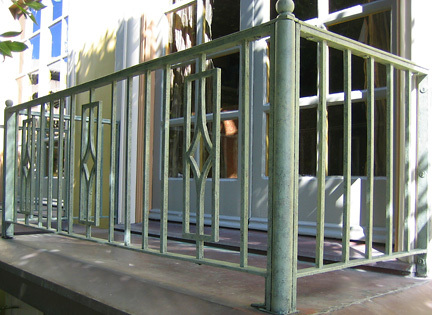 As the balcony railings are partially obscured by trees, and the Clients were less concerned about their appearance, we opted to use only the two softer greens, “Cypress Green – 509” followed by “Garden Oasis 699” stippled over the same ready-made “Forest Green” base coat. Because three of the five colors in the steps railings are the same, the color impression looks the same from a distance, an effect we wanted to achieve. 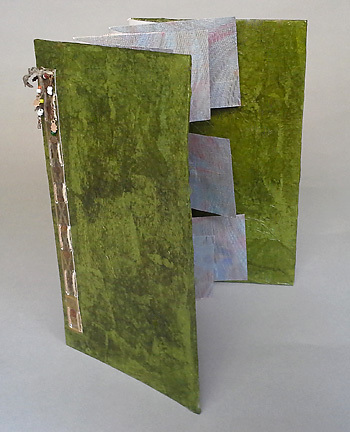 It’s interesting that verdigris, an actual effect of tarnishing and oxidation processes, can result is such vivid green, teal, and even turquoise colors, as well as beautiful, variegated textures and patina. It begs the issue of the value, aesthetic or otherwise, of antiquing, aging, even decay. 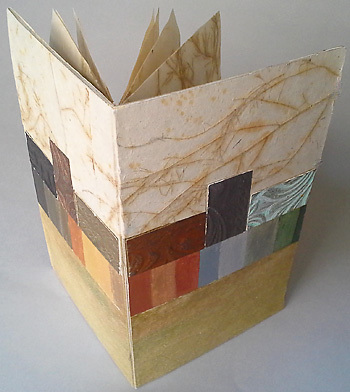 For what better purpose can we create art, decor and deign, then to both uplift, and deepen the human spirit by raising questions of beauty and mortality, and the possible connections between the two? What effect, finish, treatment or application, verdigris or otherwise has touched you with its beauty or other wise lately? What has caused you to contemplate aesthetics…or, life’s big questions? How about the relationship between the two? If you feel so inspired, please share it with us here. We love to hear from you. 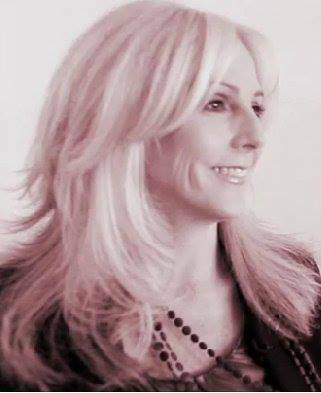 Remember, we are all traveling through this thing called Life, together. Here’s to beauty…in all it’s forms.